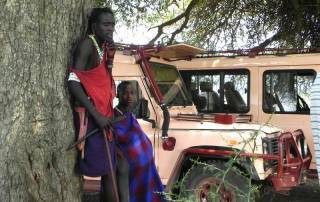 After our Lake Manyara Safari, we headed for the Ngorongoro Conservation Area and our Maasai Boma Safari. Rain and fog obscured any view of the Ngorongoro Crater. Traversing the rim, we came across one of the most imposing views of the trip. Two large elephants were on the rim close to our vehicles. 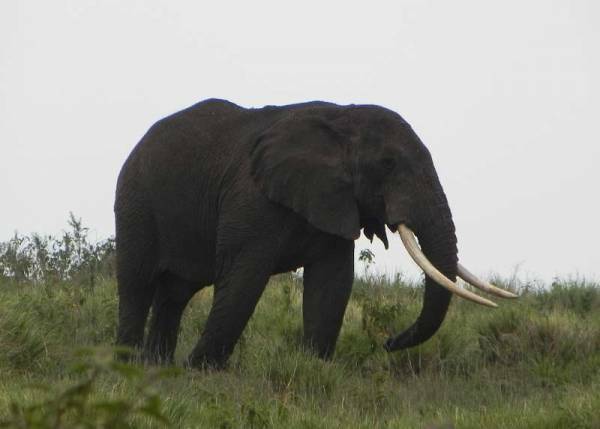 The rainfall turned them a magnificent dark black, which served to highlight their gigantic ivory tusks. What a amazing sight! The Maasai bomas (villages) are reached by traveling down the slopes of the Ngorongoro Crater and out on to the plains toward Nabi Gate and the Serengeti. Safari companies arrange the visits to the bomas. 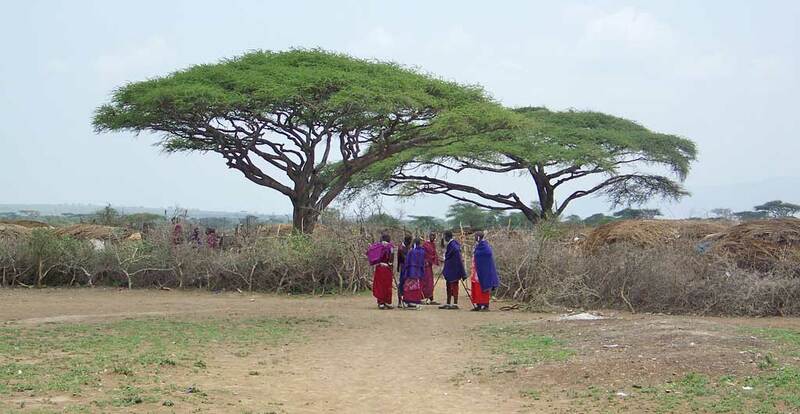 When we reached the plains, there was nothing but parched grassland interspersed with Maasai villages. 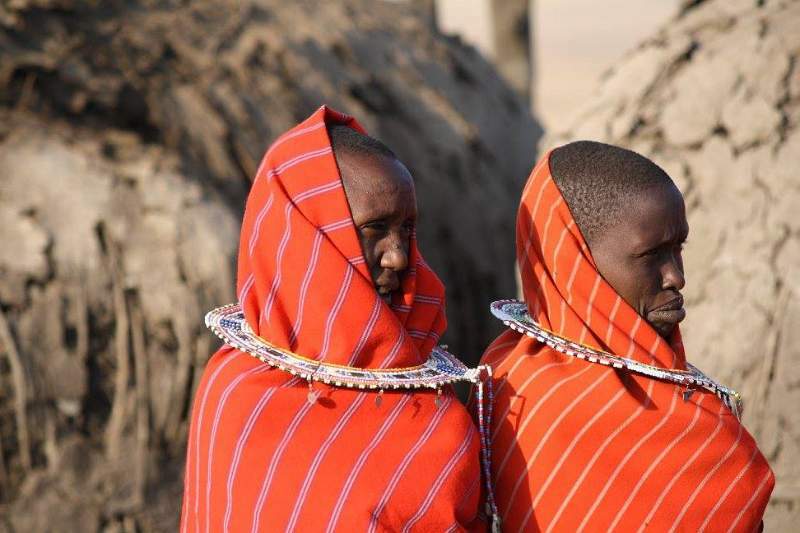 The Maasai wear distinctive robes of red, orange or purple. Along the way, we saw two young Maasai boys yelling at us from the road side. 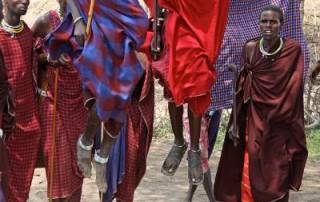 The Maasai ritual for passage to adulthood was on display. 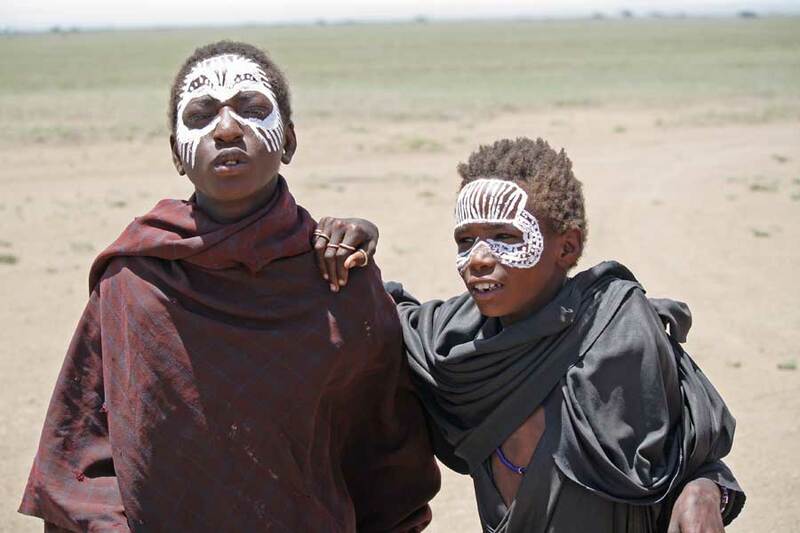 White paint streaks on their faces symbolized their newly circumcised situation. To earn the status of manhood, living for 3 months completely on their own is required. Revenue from tourist photos is a good option for survival, since food is scarce on the plains. The Ngorongoro Conservation Area was designated for the Maasai to inhabit when they were removed from the Serengeti by the Tanzanian government. Their villages (bomas) begin to appear on the eastern slopes of the Ngorongoro Crater as the gravel road descends to the plains around the Serengeti. 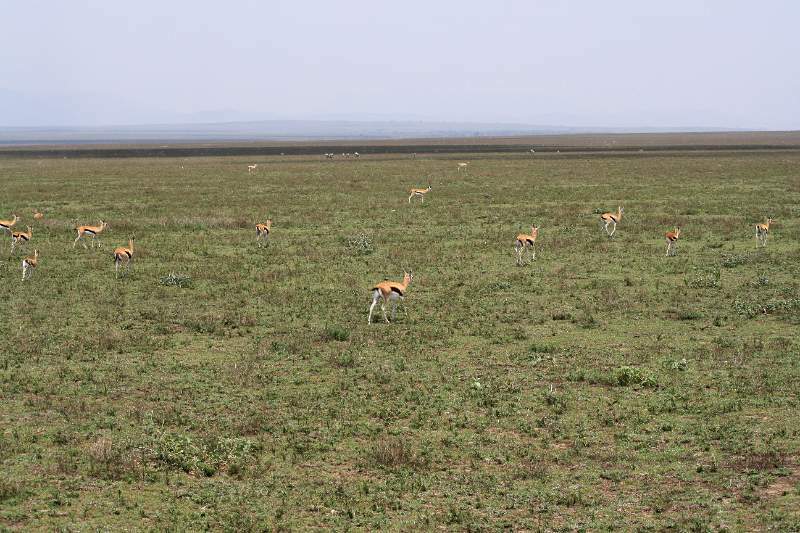 The bomas extend far out into the plains, where they graze their cattle. Bomas consist of thatch and brush huts encircled by a ring of brush. Often cardboard and refuse are used as fill in the structure. In the huts a small fire is used for cooking. At night the cattle are brought within the circle for protection from lions and hyenas. The Maasai warriors use a traditional lion club to beat off a predator attack. 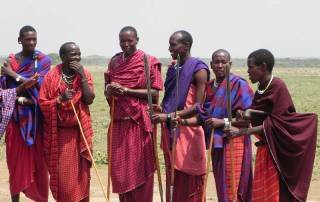 The benefits from tourism are easily understood and accepted by the Maasai. As we crossed the plain, we saw Safari jeeps at almost every village. 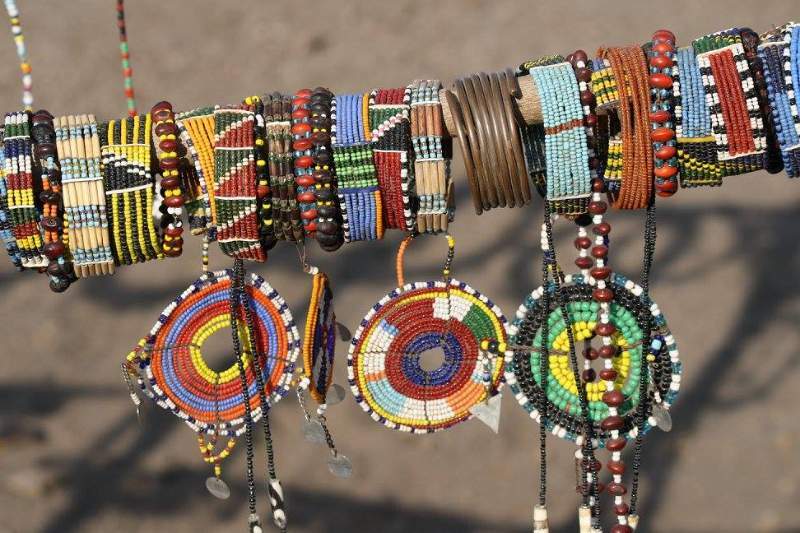 In addition to producing their own crafts, the Maasai purchase trinkets and souvenirs in Arusha. They aggressively sell these to tourists after singing, jumping and showing off their homes. 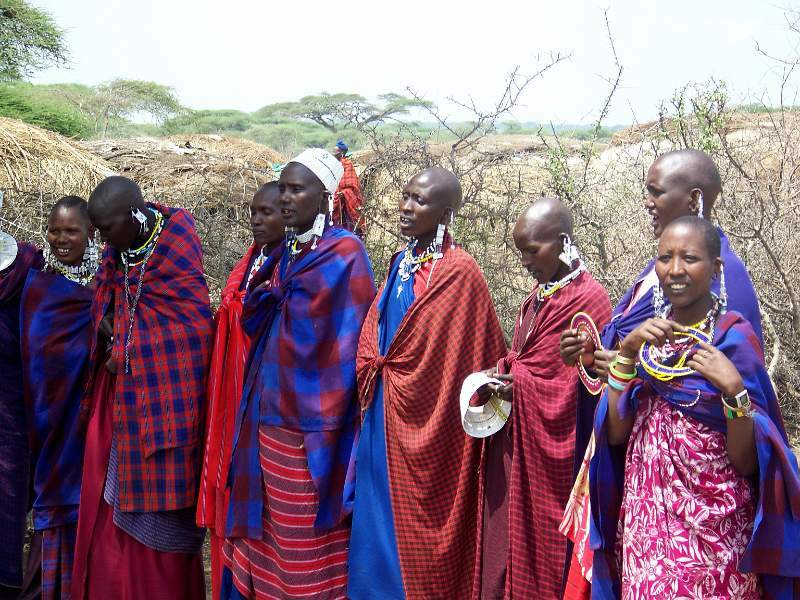 The Maasai on our Maasai Boma Safari sold lion’s teeth, which were actually sculpted cattle bone remnants. Buyer be ware! 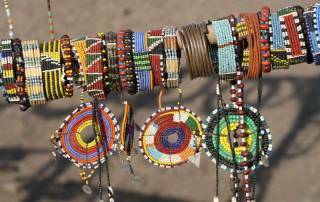 The only authentic part of a purchase from a Maasai might be who you buy it from. The Ngorongoro Conservation has a slightly lower elevation than the Serengeti, which makes it slightly warmer. The weather is temperate and comfortable on the plains and cooler on the hills surrounding the plain. There is little change in temperature throughout the year. Expect average highs in the 80s F (27 C) and average lows in the 50s and 60s F (13 C). Rainfall is lower from June – September, but the primary determinant for safaris visiting this area will be timing to coincide with the wildebeest migration on the nearby Serengeti. The boma village we visited consisted of several families, so there were more than 20 thatch huts. 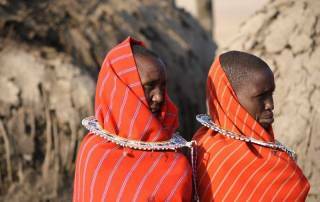 A Maasai warrior takes multiple wives, who work together to build thatch huts. 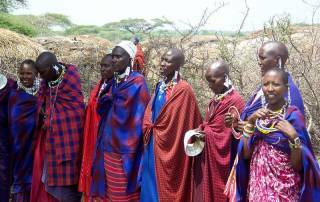 The ceremonies of our Maasai Boma Safari started with the female Maasai singing a catchy but repetitive song, while they jumped up and down. 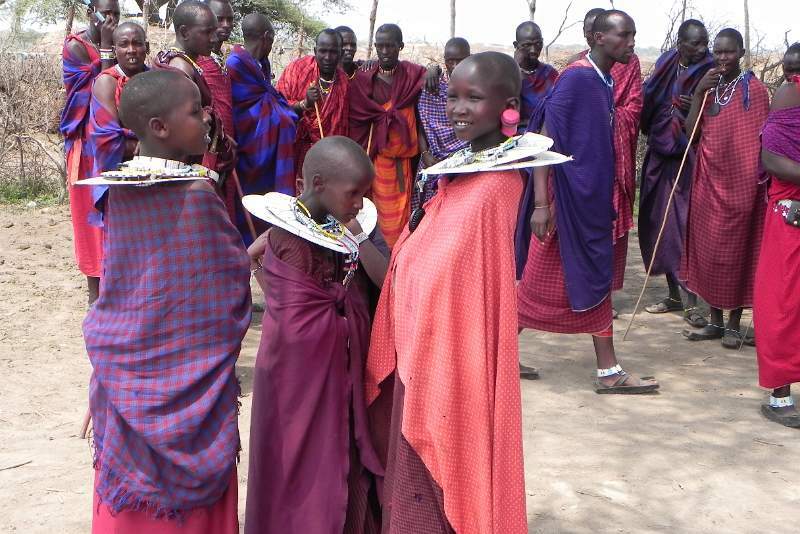 They had distinctive bead saucers around their necks, which they started placing on the female members of our safari. 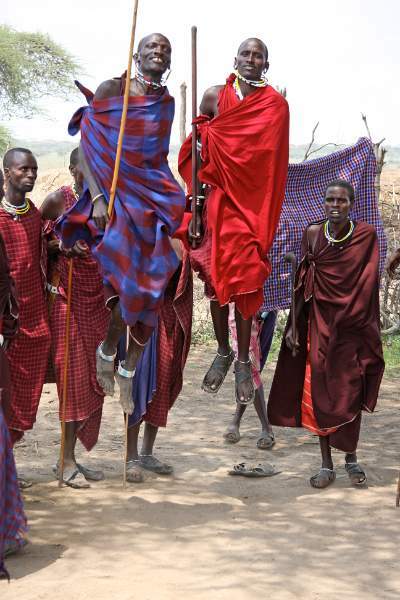 Soon the female tourists and the female Maasai women were jumping and singing. 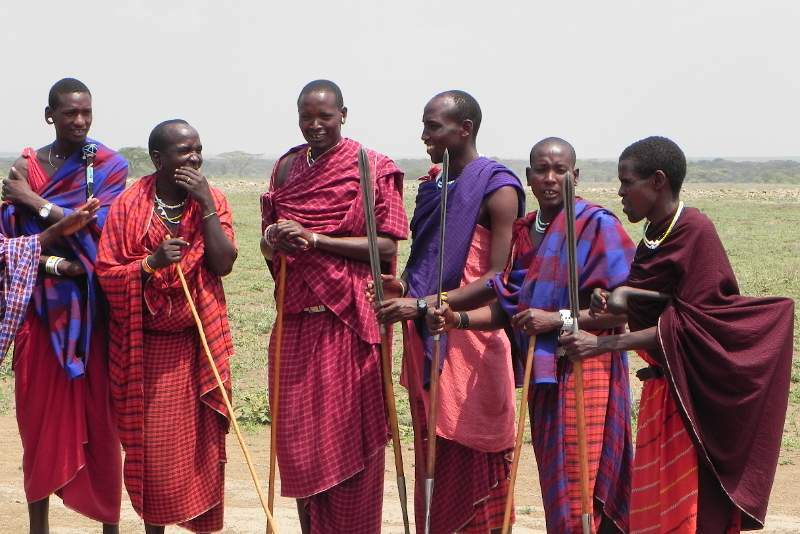 Then the Maasai warriors formed a group. They chanted and marched back and forth past our group, but males in our safari group were not invited to jump with them. After this, the Maasia invited us inside the circle of brush that protects the huts. The brush provides a lion-safe corral for the cattle each night. The Maasai had an English speaking guide who showed us the wooden clubs and metal tipped spears that they use to ward off lions. We noticed some warriors wearing sandals made from car tires. Their thatch huts are less than 4 feet high, which makes it awkward to enter. Inside was a metal drum for water and a small fire in the common area. It barely fit 4 of us and it was extremely hot with a small charcoal fire burning. The small amount of smoke made its way out a couple of holes in the roof. 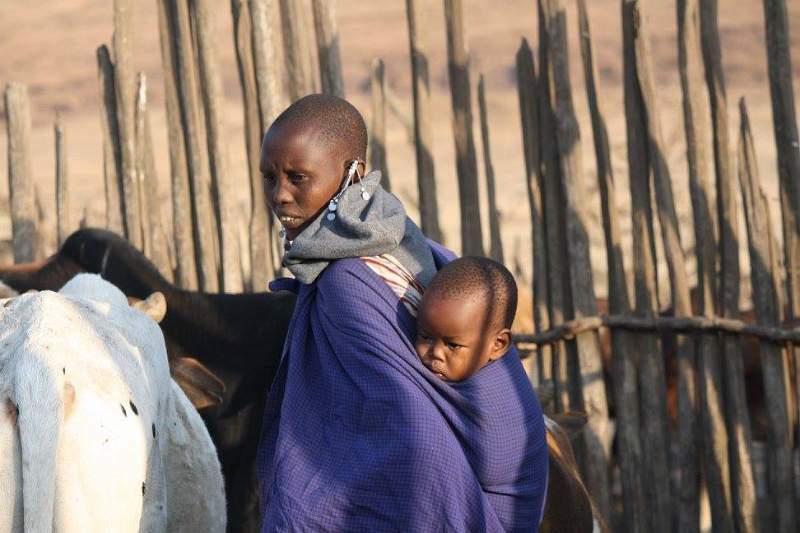 You could see the adaptability of the Maasai. They used thatch, dung, cardboard boxes and paper they’d found discarded on the plain. 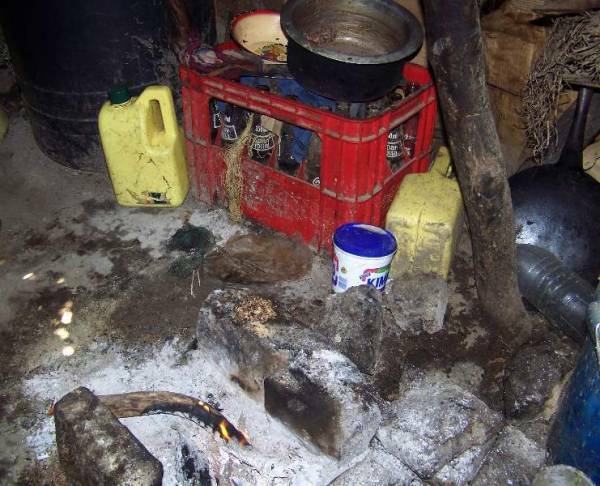 The father had a large sleeping area about a foot off the ground in each of his wives’ huts. The wife has a separate section, smaller than the size of a double bed, where she and all her children sleep together. Next we were taken to the open inner circle of the village which was ringed in a large array of trinkets and curios for purchase. Most of the items seemed to have been purchased for resale instead of made by hand. Sharpened cattle bone necklaces were claimed to be lion’s teeth. I bought one anyway. After the selling frenzy we visited their school. It was a rectangular thatch building outside the compound and it was high enough to stand in. 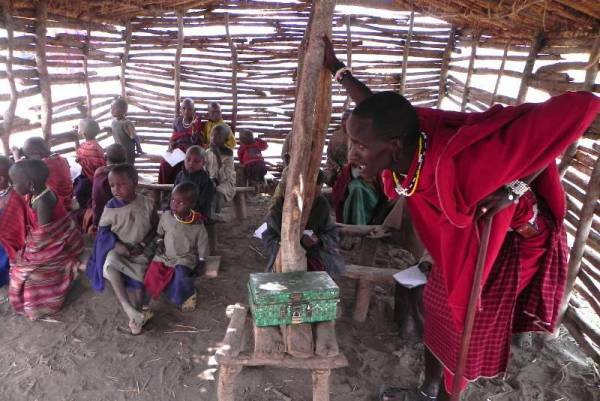 There were no desks and only one chalkboard at the front for the use of the two teachers and the twenty students. The teachers taught them Swahili and English. The kindergarten aged children showed off their ability in English numbers and the English alphabet. The surprising part of the visit was the realization that we were are not only visiting the Maasai, but that we were in part responsible for their assimilation into the rest of Tanzanian society. The village we visited is no longer nomadic and depends heavily on tourist revenues. They use the funds to ride buses to the cities where they purchase water and other goods for their survival. Not a bad thing – just a way of life that is changing quickly. After the village visit we drove on across the plain. As we were still in the Conservation Area, there was no requirement to stay on any roads or trails. So we headed off across the short grass plain as a 4 wide convoy, driving where there were no roads. The experience creates a great sense of freedom and adventure. We stopped for lunch under the shade of a solitary large tree that sheltered all 4 vehicles. We ate safari box lunches and enjoyed fresh made tea and coffee, which was served on the hoods of our vehicles. 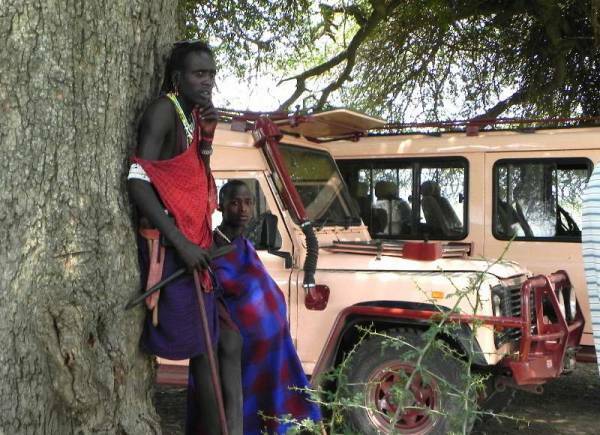 There were two Maasai under the tree when we arrived and they rested at the tree trunk during our stay without ever saying a word. I couldn’t help notice that the best dressed one had neatly braided hair, clean traditional clothing, a wooden club & spear for lions and a cell phone!